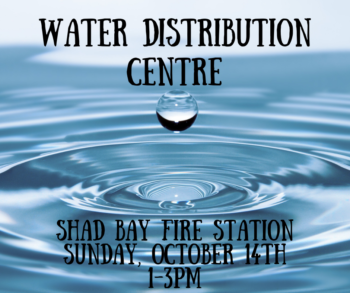 On Sunday, October 14th from 1-3 pm water will be available at the Fire Station in Shad Bay. 2 liters per person per household will be available for those in need. Community members are also welcome to use the Prospect Road Community Centre facilities for showering during our regular hours of operation (Monday – Friday 8:30am-10pm & Saturday – Sunday 8am-9pm).